FOXBOROUGH, MA -- Tom Brady threw for three touchdowns and LeGarrette Blount ran in three more on Sunday to lead the New England Patriots into the Super Bowl with a 45-7 victory over the Indianapolis Colts. The Patriots won their eighth AFC championship - their sixth under Brady and coach Bill Belichick. They will play the Seattle Seahawks in Super Bowl in Glendale, Arizona, on Feb. 1. 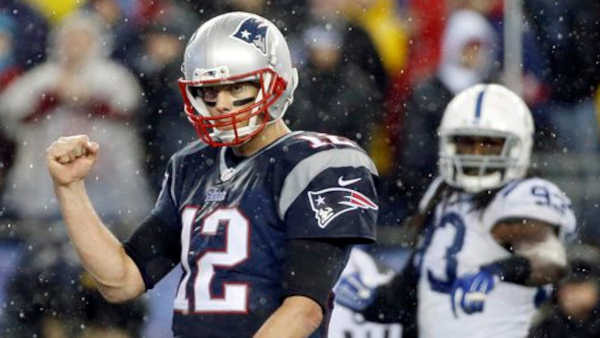 New England (14-4) opened a 14-point lead in the first half and then broke it open in a driving rain with three third-quarter touchdowns and another to start the fourth. That made it the second-most lopsided game in AFC championship history. Brady completed 23 of 35 passes for 226 yards. Blount ran 30 times for 148 yards. Andrew Luck completed 12 of 33 passes for 126 yards with two interceptions for the Colts (13-6).